May 25th, 2014: The mother of all elections in Belgium. The Flemish social-democratic party is under pressure. Polls indicate that right-wing parties are gaining in popularity. Our challenge was to set out a specific course in West-Flanders. People usually don’t believe what politicians say. We decided to show them what these politicians do. 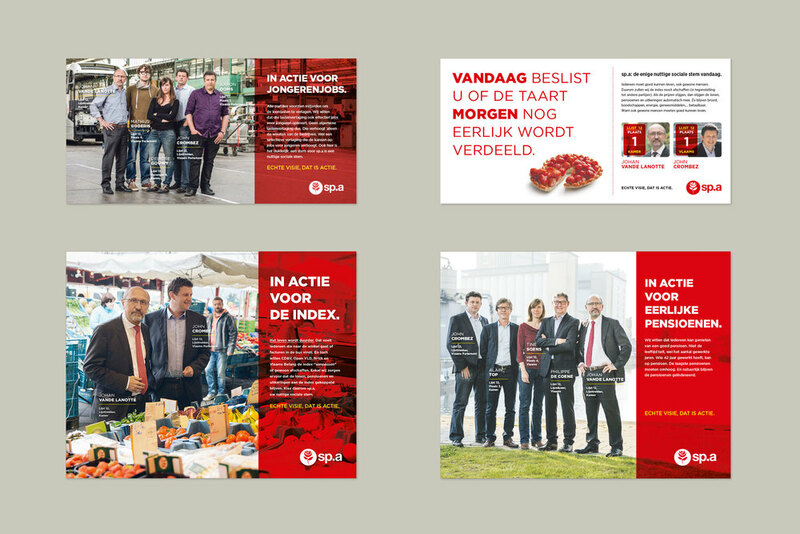 We started by building a powerful image around John and Johan, the two West-Flemish protagonists, introducing the campaign slogan “Real vision is action”. A series of advertisements, posters and leaflets depicted their actions and expressed the main themes. A week before the elections, we released an online video about a hot topic: the preservation of the index. The video was a big hit in the media. It was picked up by every Flemish news site and news broadcast and became the subject of debate in three election talk shows, resulting in a value of over 900.000 euros in earned media. As a last reminder on the morning of election day, we handed out door hangers referring to the same index theme. As a result, after a decade of decline, sp.a grew by 2,18% in West-Flanders.